ATV racing on the nationally reknowned Washougal MX track – the same track our favorite bikes race on in July. 2nd Annual Pit Traffic Potluck is happening Saturday – we eat, we talk, we are merry. It’s a great party. 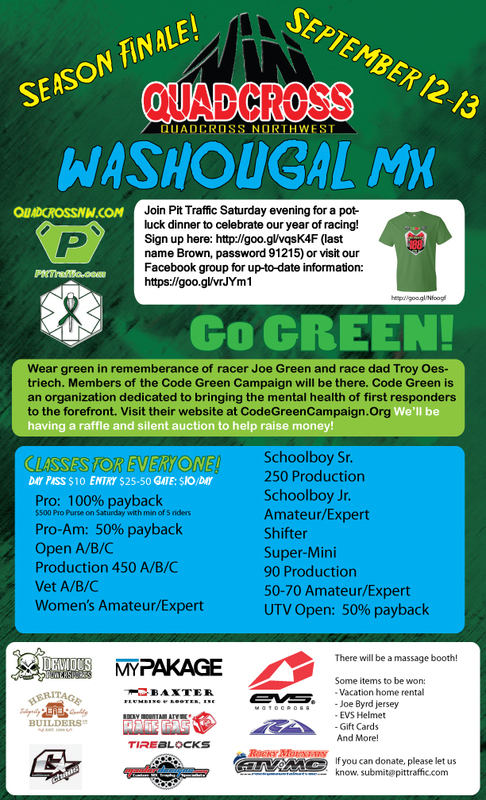 Code Green Campaign was started after the death of Joe Green, a beloved racer in our community. CGC aims to raise awareness to the mental health issues first responders face. This includes EMTs, Paramedics, firefighters, police officers, flight nurses, critical care teams, wildland firefighters, search & rescue, etc. The development of a CECBEMS accredited continuing education class. Operating expenses like financial software, office supplies, and business cards. Professional services such as an accountant and a lawyer. Merchandise and shipping supplies (current merchandise sales currently cover these costs, although the initial purchases were made with donations). Education and training for the board of directors for things like peer counseling and suicide prevention. Eventually, scholarships for mental health training. MASSAGE BOOTH! Proceeds from the massage booth go to help participate in the Out of Darkness suicide prevention walk. and MORE! (Seriously, there is a lot you can win). What’s more fun than racing, eating, and winning? Not a whole lot. Quadcross Northwest has classes for all ages and abilities, from kids to kids at heart, amateurs, newbies, Pros (with payback) and women’s exclusive classes. You do not want to miss out on this event. If you can’t make it, please share so others know. If you don’t race, that’s ok, come out and enjoy the fun! If you want to race, come out and we’ll help you get going. Visit Quadcrossnw.com for racing information. If i order a sweatshirt and do pick-up will it be in washougal next weekend to pickup?